During the summer months heat often coincides with drought. When this happens, your lawn may turn brown in lieu of the lovely green that many cherish. Of course brown doesn’t necessarily mean that the lawn is dead, however, it is rather unsightly. It’s from the drought that is called summer dormancy. There are many ways to combat this condition. You can start by planting grasses that can tolerate drought and heat. Southern grasses like Zoysia, or Centipede or even Bermuda are just slowing down and lying dormant in your yard. They’re not dead, this is a great boon to your yard in that they can lie dormant and return to their gorgeous reign of glory when it rains or you water. In order to reduce the issue, you’ll have to find ways to combat it. When it rains your lawn turns a lovely green and returns to its normal state. Dormancy in the summer is just as it is in the winter. We know that when spring arrives our lawns look lovely again. 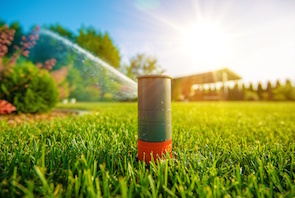 We’ve learned that proper lawn care will help to lower the risk of permanent damage from drought as summer grasses adapt to their conditions. These 10 Steps to help will greatly reduce your lawns health issues from drought. Mowing: Avoid over mowing and reduce the frequency of mowing already stressed grass. Height: If you must mow, raise your cutting height as high as 50 percent over what you normally do. Also keep the blade extra sharp. Fertilize: Stop fertilizing your stressed lawn. This will only cause it to grow more and since it’s not being watered it will be stressed. Deep Watering: When you can water, water it deeply without any run off. It’s better to allow it to soak than to water it too often. Timing: Ideally, the best time to water your lawn is between 10 am and midnight. Wind: Avoid watering when it’s windy. This can cause too much evaporation and your lawn won’t get as much water as you think it is. Inspect: Inspect your lawn. The sooner you control weeds and insects the healthier your lawn when it is watered (either via rain or irrigation). Choose Wisely: Choose drought tolerant grasses in lieu of those that require a lot of water. Drought tolerant are grasses such as Zoysia or Centipede or Bermuda. Allow the lawn to go dormant and you’ll see an amazing recovery. Obey The Law: If you’re not allowed to water, don’t. Check your Georgia local water restrictions. Exceptions: If you’ve recently planted your lawn you may be eligible for an exemption in many states. Check with your local municipality to ensure that you can water if you’re recently planted or plan to plant. Some areas will allow a recently sodded lawn to be watered for up to 30 days in spite of a drought policy. Read the fine print and ensure that you’re within the parameters of the law to avoid fines. Your lawn only needs about 1/2 inch of water or rain per week to look lush and lovely. Remember: You don’t need to water until the water runs off, that is wasteful. Water deep and infrequently to ensure a healthy beautiful lawn.